This is not going to be a long blog post. I have been reading a lot of articles about what has happened in Japan lately. (Seriously on the first day I read the news and viewed the video on the tsunami, I have been pretty down and worried about what has happened in Japan - A country that I have love after visited them for 3 times. I have even sent an email to a friend in SG who has a friend in Japan just to check if everything is alright with their family. :( ). Anyway, despite on all the worries that I have for them during these hard time... The courage, discipline and unselfishness shown by the people in Japan all their actions have really touched my heart every time I read the report or message about their actions. (Sometimes it almost brought me to tears). This has really shown the unity of the people in Japan during hard time and they know that they are on the same boat no matter what happen in their country. Anyway, do check out some of the tweets that have been sharing in the Facebook. and also some of the drawing that has been draw by one of my favorite Japan comic artist Inoue Takehiko (who draw Slam Dunk, Buzzer Beater, Real n Vagabond) to encourage the people of Japan. He has started a series of drawing. (All are drawn from an Ipad) which titled as Smile. Do check it out all those drawing are just great. \:) (Which pretty much has inspired me for my photo of the day). 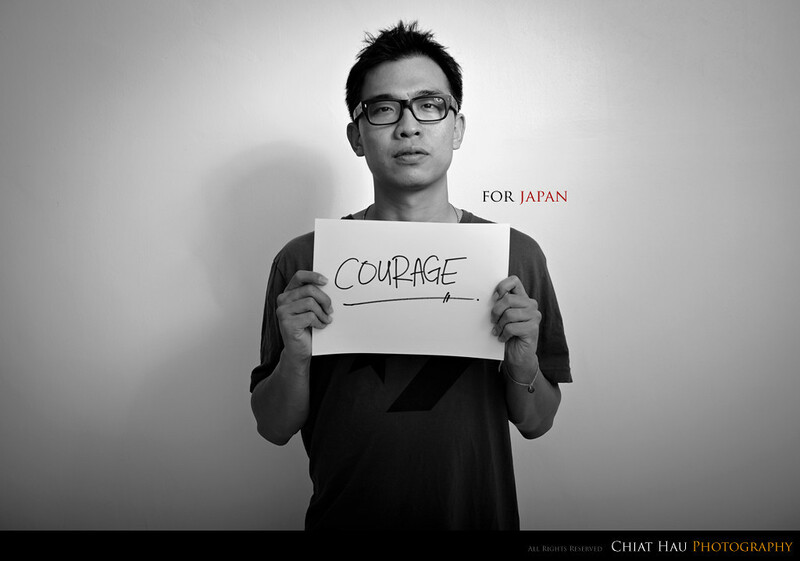 These is Courage for Japan. Good night people... signing off. I think many people have mixture feeling to Japan especially those old folks who have come thru from war started by Japanese and still mentally suffered. I heard some China people even cheer for this tragic - obviously they still very hate the Japanese. On the other hand, I read news today a Japanese has saved 20 over Chinese students in Japan during the tsunami invasion that later lost his life when he runs back to save his family after settle down the Chinese students. What a mighty scarify... 2 very extreme feelings demonstrated by both Chinese and Japanese during this crisis. Hope for the best for Japan! I am sure they can go thru this difficult moment. Kambateh! Yeah I can't agree with you more on that. There is a mixing of feelings (or probably I should say 2 sides of feeling here). But again, base on some of the actions that Japanese did. I think they have really show unselfish (regardless of race or anything) during all the crisis. Probably, we should have the feeling like a professional doctor: No matter how bad a person is, if he is dying, the doctor will still need to save his life. Yeah I think so... So just pray for a better world to stay in. At least I know I am doing that everyday now.